When they approached me months ago, they asked me to pick a book that was a classic or somewhat representative of the fantasy genre, and they said they preferred a stand-alone to a series book. 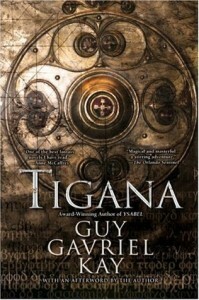 It took me a while, but I settled on Tigana—a leap of faith since I’d never read the book, myself. So, if you’re interested, click here for a summary of our discussion. Tigana is such a beautiful and brave novel. I’m glad I picked it, and I’m glad I had to think about it hard enough to help other people talk out loud about it. Even though I am kind of whiny above, leading the club was a huge pleasure.